It’s the thrill of recording yourself singing your favorite song or a freestyle performance – matched by the “enjoy it and share it ” experience of your own CD , e-mailed performances, Web uploads, and even competing. In addition to instantly producing their own CD’s , customers can send a “Sing-A-Gram” from the booth and post their vocal performance on our website along with a video intro and even enter scheduled talent competitions for fame and prizes. A typical customer pays $10 to record 2 songs (MSRP) on a custom-produced CD that is automatically labeled and dispensed while in the booth. 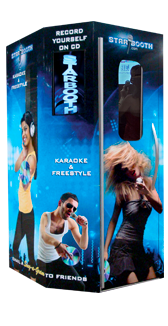 Starbooth® can be an exciting activity anywhere young people gather. It can also be an immensely popular attraction for wedding receptions, birthday parties and any special event – with people of all ages who love to sing. The StarBooth® experience is a both fun and rewarding. It is totally automated, completely affordable, extremely simple to use, and suitable for both adults and children. Envision millions of people of all ages and social backgrounds given the chance to express their talent just like their favorite music stars. With the StarBooth® vending system this vision is now a new and exciting reality.